Normally customers want to operate their layout with some degree of automation. Very often the safe drive where trains or cars obeys signals and rules is the most important. On top of that the creation of events and corresponding intersections and waitings and drive also have some priority. Still many customers also want to have some cars or trains in the hand while the safe part is taken care of. GT-Command has a great variety of automatic options for customers. Especially in combination with the position system you can easily create a lot of automatic support on your layout. 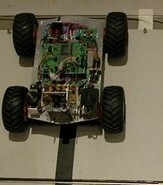 1) Automatic support without writing any programs, just inserting signals and signs on the drawing of the layout and let the vehicles obey the rules of the signals and signs. You just turn on signals and turnouts and the trains and cars adjust their drive accordingly. 2) Write or copy single automation programs using our well proven automation wizards and scripting. 3) Fully automate hours of drive and events without manual interferance . Please see under "Signals" how to apply signals, signs, and sections in order to regulate the traffic. On top of having signals, signs, and sections inserted on the layout you can create certain events. As an example you can create commuting traffic between two destinations. You actually write a small program using our script where you state the commands to the vehicle and to the layout what you want to do in what order. 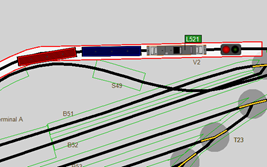 In the example train L521 goes forward and backward between Station A section B74 on the upper part of the layout and Station B section 400 on the fiddle yard using via T28 turn. The train stops 15 seconds before it returns. The train moves 6 seconds into section B74. It can be done more elegantly using signals and stop sections etc., but it Works. All Automations can be started and stopped in the automation control form. There are many macros and automation functions available for customers to apply. Good examples are the block-control program where Blocks (sections ) actually stop and let trains go depending on if the block ahead (or any combinations of blocks ahead and sidings etc.) is occupied or not. Another example is the automatic selection of free track on a station area. Stop the train at the drive in signal, look around with the position system to find free sections at the station and set the route and drive the train to the first free section, or let it stay until a free section is detected. 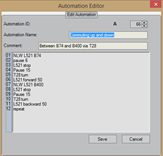 Atomations can start and stop other automations, you can issue any command by a script line in the automation program for vehicles, vehicle functions, turnouts, signals, signs, sections, sounds, routes, and more. You can let the whole layout wake up and start with one automation setting lights and turnouts in initial positions. Then letting certian trains go and let them tigger other trains. Likewise you can close the layout down and park trains or cars as you like. The manual has a complete list of automation commands available.